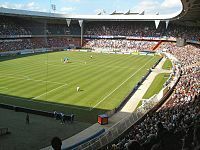 The 1960 European Nations' Cup Final was a football match at the Parc des Princes, Paris on 10 July 1960, to determine the winner of the 1960 European Nations' Cup. It was the first UEFA European Football Championship final, UEFA's top football competition for national teams. The match was contested by the Soviet Union and Yugoslavia. Soviet Union won the match 2–1 after extra time; Yugoslavia opened the scoring through Milan Galić just before half-time, before Slava Metreveli equalised just after the interval. The match finished in a 1–1 draw after 90 minutes, with Viktor Ponedelnik scored the winning goal in extra time in the 113th minute. ^ a b c "Soviet Union 2–1 Yugoslavia". UEFA.com. Union of European Football Associations. Archived from the original on 17 August 2000. Retrieved 1 July 2012. ^ Brewin, John (1 May 2008). "European Nations Cup 1960". ESPNSoccernet.com. ESPN. Retrieved 26 January 2013. ^ Dunmore, Tom (8 December 2007). "European Championships Retrospectives: 1960, France". pitchinvasion.net. Retrieved 26 January 2013. ^ "Euro 1960 in France". euro2008.football-shirts.co.uk. Archived from the original on 11 July 2011. Retrieved 1 March 2013.